A group of experts from the Rhode Island School of Design released a study Monday morning finding that, contrary to recent suggestions by the President, Donald Trump's nuclear button is not actually bigger than Kim Jong Un's, but just appears that way in comparison to Donald Trump's tiny baby hands. Visual Design Professor David L. Roth explained that things often appear larger than they actually are when placed next to a diminutive item. "It's called 'forced perspective, a common visual illusion used in movies and art that makes objects appear farther away, closer, larger or smaller than it actually is by manipulating human visual perception through the use of scaled objects and the correlation between them and the vantage point of the spectator or camera.' said Professor Roth. 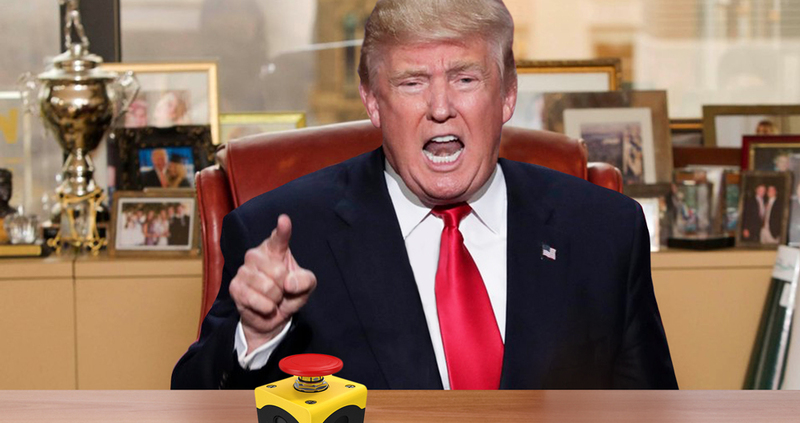 The report also doubted Trump's claim that his button "works better" than Kim Jong Un's, finding that it appeared the button Trump believes is the nuclear launch button is actually just a novelty "easy" button placed on his desk by staffers that can be found at any Staples.